OptiFiber Pro’s award-winning interface is enhanced with a number of new features to support these applications, including automated identification of splitters and Expert-Manual mode, which allows users to optimise the instrument’s performance by easily modifying automated settings chosen by the OTDR. This is in addition to groundbreaking features, including automated set-up, pinch-and-zoom analysis of traces and Event Map interpretation of results. “The Event Map easily identifies everything on the trunk; it’s a real time-saver,” adds Ziegler. Availability: The Fluke Networks OptiFiber Pro HDR OTDR is available for purchase from resellers worldwide, and is also available for rent from select suppliers. 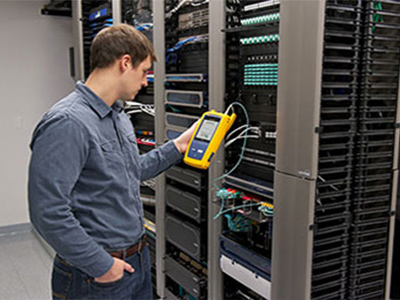 Fluke Networks is the worldwide leader in certification, troubleshooting and installation tools for professionals who install and maintain critical network cabling infrastructure. From installing the most advanced data centres to restoring service in the worst weather, Fluke Networks’ combination of legendary reliability and unmatched performance ensure jobs are done efficiently. The company’s flagship products include the innovative LinkWare Live, the world’s leading cloud-connected cable certification solution with over 14 million results uploaded to date. Bitrate, in operation since 1999, has substantial experience in IT security, network monitoring, application performance monitoring, network troubleshooting and cable infrastructure certification.For more details, visit: https://www.bitrate.co.za/.